We understand it can be a stressful time when your pets fall ill, that is why we try to do everything in our power to make you and your pet feel reassured. The care and comfort of our patients is as important to us as their medical treatment. We have a team of devoted nurses caring for our in- patients who have many years of experience across a broad range of species. With huge amounts of compassion and consideration our veterinary nurses strive to provide the best care possible. All of our qualified nurses are trained to a high standard and are registered with the Royal College of Veterinary Surgeons. We have two wards, enabling us to separate different patient species, as well as isolating contagious or nervous animals, so reducing patient stress. Infusion pumps are used for accurate administration of fluids and medication to critically ill pets. Extensive patient monitoring equipment enables us to check their progress. Whether your pet is a day patient or an in patient, we will stay in touch and communicate with you throughout the day. We ask that you try to bear with us at busy periods, our patients are our priority and we will endeavour to speak to owners as soon as we can. 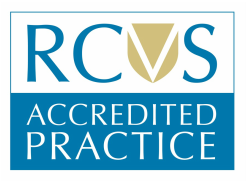 The Royal College of Veterinary Surgeons (RCVS) has registered us as a tier 2 practice in recognition of the level of care we provide.